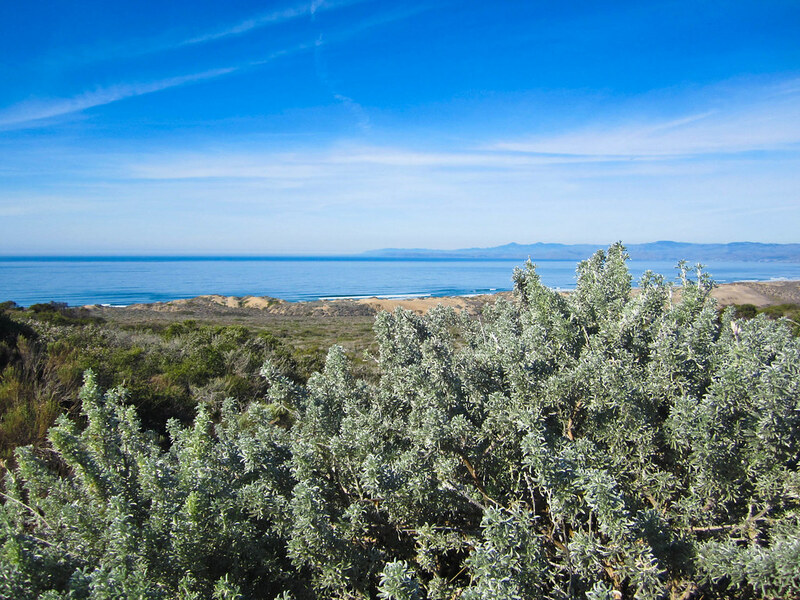 I went to Montana de Oro again the other day to see if any wildflowers were blooming yet and to enjoy the ocean and bay views. I am a bit clueless when it comes to California coast wildflowers. I usually know the general genus but even after pouring over the Calflora website I am stumped on specific species. So feel free to let me know what some of these are. These huge silver lupine shrubs are very common here. But which species is it? What color will the flowers be? Lots of Arctostaphylos covered in buzzing bees. Not sure exactly which species. These architectural beauties are very common but I am afraid I don’t even know the genus. Very fine Artemisia like foliage and fuzzy little seed heads. There are usually lots of bare braches showing like this specimen. What is it? It must be something that every native Californian learns as a child but I’m an east coast expat. I know what this one is. Sadly it is not native but an invasive from South Africa. 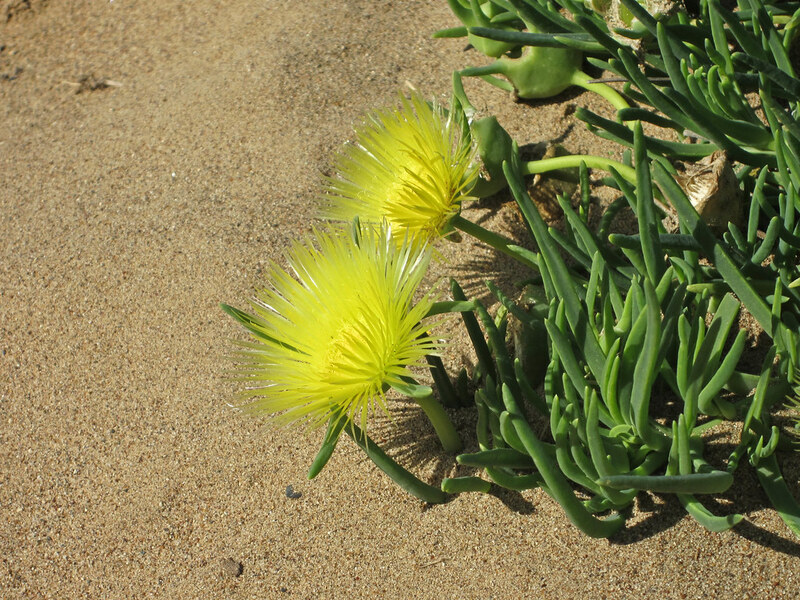 Conicosia pugioniformis or false iceplant. Even though they are listed as an invasive they don’t seem quite as insidious as Carpobrotus but maybe I just haven’t seen them in the right place yet. There are quite a few of these about though. At least they are prettier than Carpobrotus. 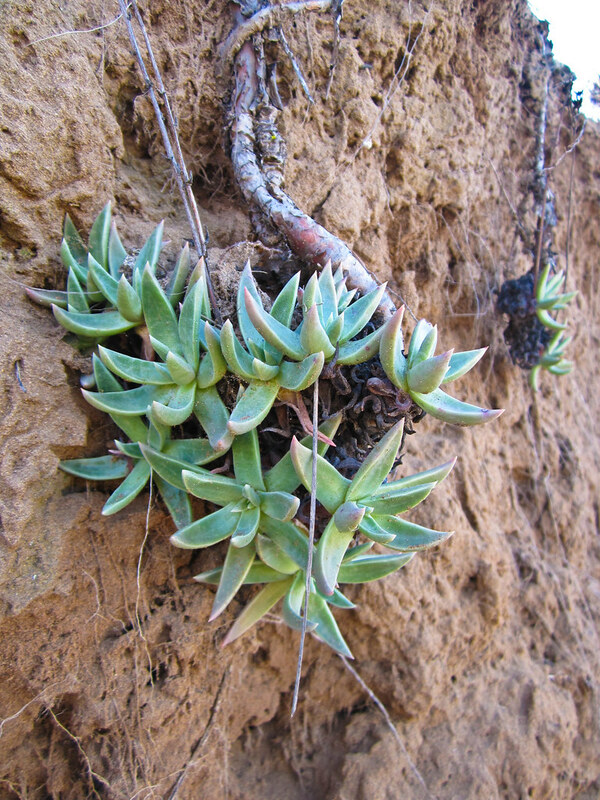 I am pretty certain this is a Dudleya. But which one? D. casepitosa perhaps? Just like the Arctostaphylos these Ceanothus are covered in happy buzzing bees. Don’t know the exact species on this one either. Yay! An easy one. 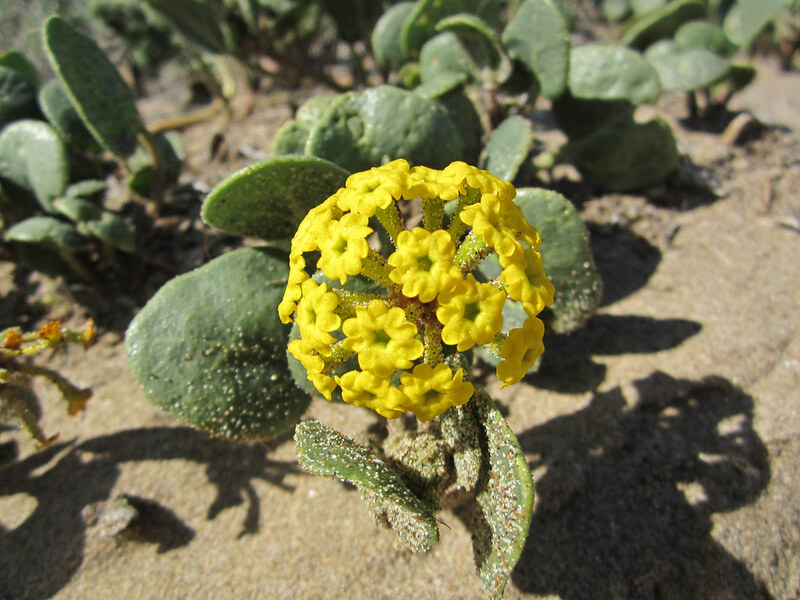 This is Abronia latifolia or yellow sand verbena. There is also a purplish pink variety. 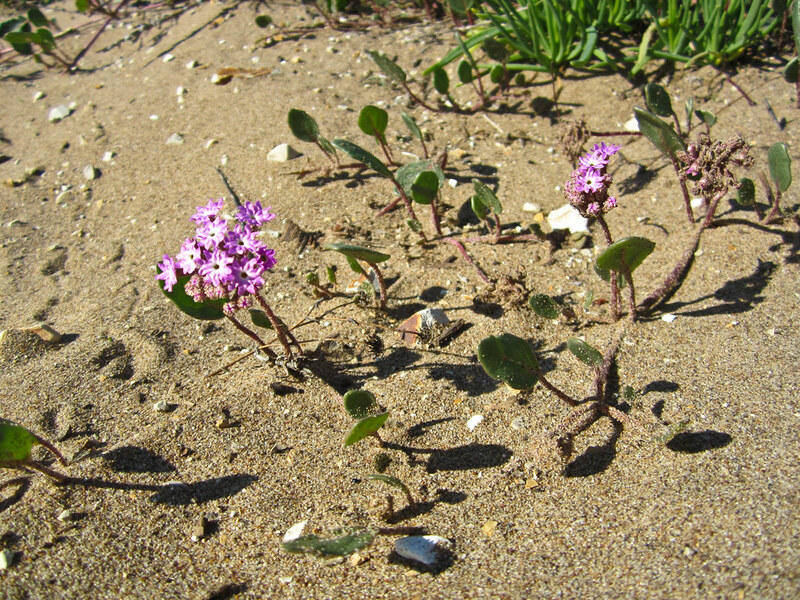 Abronia umbellata or purple sand verbena. 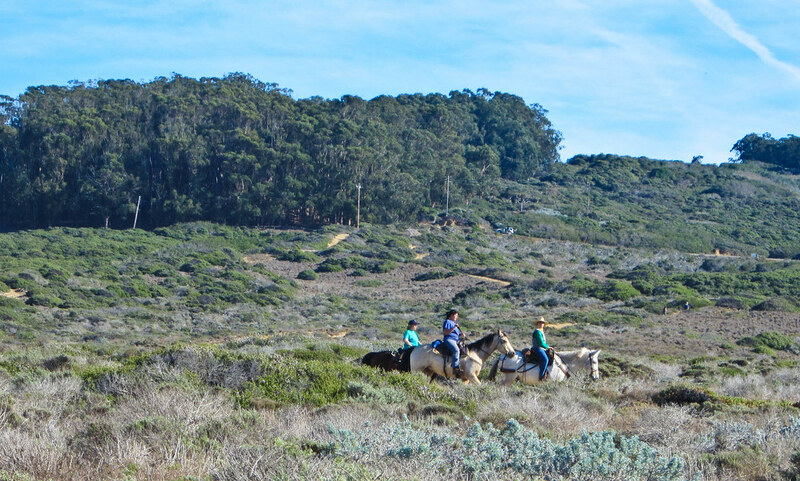 Horses are pretty common on the dunes and on the beach. This yellow flowered plant was driving me crazy. I feel like I should know what it is but I can’t even figure ou the genus. The flowers are small and kind of delicate and papery looking. Finally an easy one. I believe this is Mimulus aurantiacus. 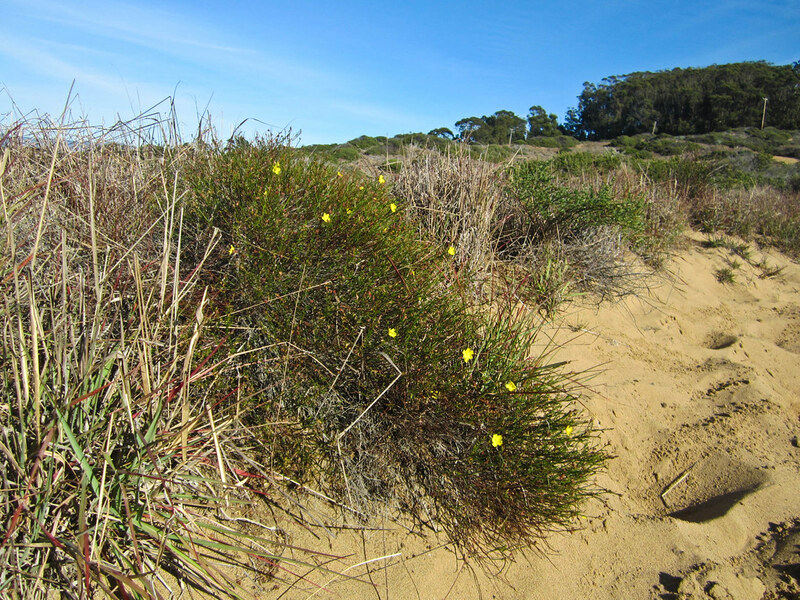 I need to get a book on coastal wildflowers. 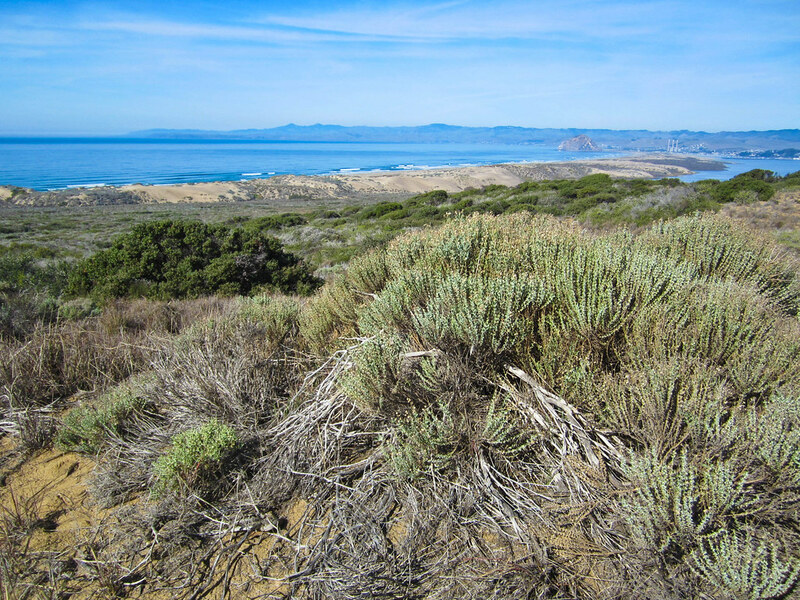 This entry was posted in California, Los Osos, Plants and tagged Abronia, Arctostaphylos, California, Ceanothus, coast, Dudleya, dunes, iceplant, Los Osos, lupins, Mimulus, Montana de Oro, wildflowers by entire leaves. Bookmark the permalink. This palette is entirely unfamiliar to me, and the only one I thought I knew was an Iceplant, and then you tell me it is not. Anyway, it looks like a great spot to enjoy the day and not worry about plant names. I always worry about plant names! It took me a while to find the name of that ice plant. It drove me a little bit crazy as it is not one I was previously familiar with but I have seen it quite a bit since moving here. Gabe tells me that the lupin is Lupinus chamissonis and the manzanita is Arctostaphylos moroensis. So that is two mysteries solved. Encelia for the yellow daisy? Might be a bit too far north, though. There is a native Artemisia, A. californica. Thanks for the tour, it looks like a lovely place. Welcome hoover! Not an Encelia I’m afraid. It is rather like a cross between a broom and a poppy. I tried to get closer pictures of the flowers but I just had my point and shoot and it doesn’t take great pictures up close half the time. I’ll have to go back and get more pictures. 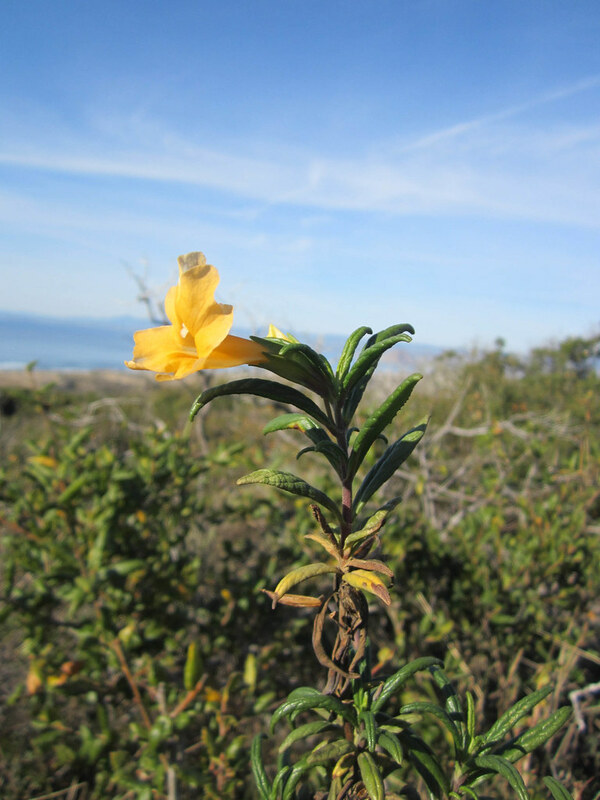 yeah, you are in an area full of endemic coastal chaparral plants that aren’t even found in other parts of California. They are tough. I would say you should post them on iNaturalist.org and see if you get any IDs, but I just acme from there trying to remember what that coastal chaparral ceanothus is . You could give them a try anyway. 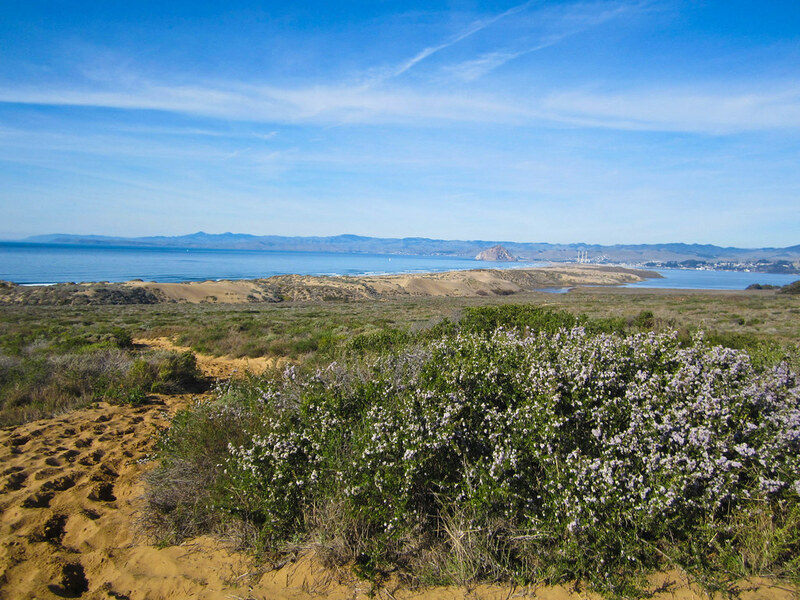 The lupine Might be L. albifrons, the manzanita is a coastal chaparral endemic I don’t know, the artemisia-like plant could be an ericameria, the dudleya may be D. lanceolata, the ceanothus may be the stunted coastal form of C. cuneatus (which can get purplish flowers unlike the more common variety) and the yellow one on the dunes is probably helianthemum scoparium or something similar. Neat finds! I believe the manzanita was ID’d as Arctostaphylos morroensis and it is Ceonothus cunneatus. The lupine is Lupinus chamissonis, there is tons of it around here. Thank you so much for the H. scoparium ID. That is definitely it. That was driving me crazy. I never would have guessed it was a Helianthemum. 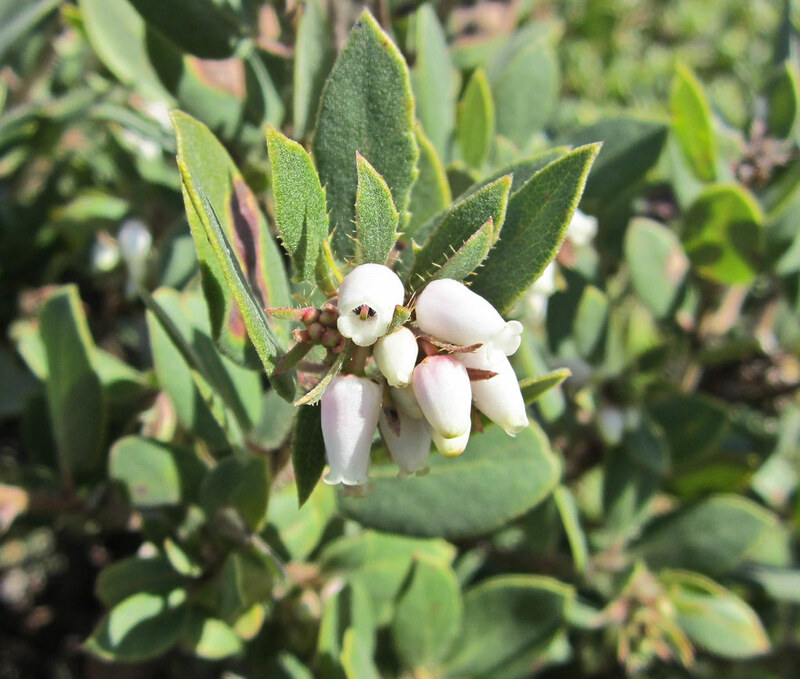 also your arctostaphylos may be A. morrowensis, a neat endemic that is highly restricted in range! Oops. Just saw this. yeah definitely A. morroensis.